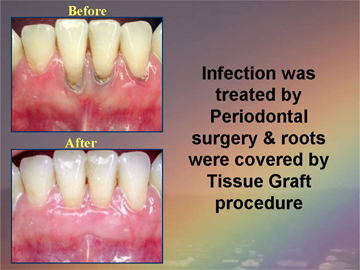 Periodontal (Gum Disease) Treatments. Z Dental Group - Beverly Hills Dentist, Los Angeles Dentist. How can one tell if one has gingivitis or periodontitis (gum disease)? * Smoking or chewing tobacco – Tobacco users are more likely than nonusers to form plaque and tartar on their teeth. * Certain tooth or appliance conditions – Bridges that no longer fit properly, crowded teeth, or defective fillings that may trap plaque and bacteria. * Many medications – Steroids, cancer therapy drugs, blood pressure meds, oral contraceptives. Some medications have side affects that reduce saliva, making the mouth dry and plaque easier to adhere to the teeth and gums. * Pregnancy, oral contraceptives, and puberty – Can cause changes in hormone levels, causing gum tissue to become more sensitive to bacteria toxins. * Systemic diseases – Diabetes, blood cell disorders, HIV / AIDS, etc. * Genetics may play role – Some patients may be predisposed to a more aggressive type of periodontitis. Patients with a family history of tooth loss should pay particular attention to their gums. * Red and puffy gums – Gums should never be red or swollen. * Bleeding gums – Gums should never bleed, even when you brush vigorously or use dental floss. * Persistent bad breath – Caused by bacteria in the mouth. * New spacing between teeth – Caused by bone loss. * Loose teeth – Also caused by bone loss or weakened periodontal fibers (fibers that support the tooth to the bone). * Pus around the teeth and gums – Sign that there is an infection present. * Receding gums – Loss of gum around a tooth. * Tenderness or Discomfort – Plaque, calculus, and bacteria irritate the gums and teeth.